Get started with these frugal tips for cleaning with borax. You will be amazed with these borax cleaning tips and how much you can do with one simple ingredient. I just love it when there are simple and frugal ways to do things. Today I want to talk to you about cleaning with Borax to go with our house cleaning tips and tricks. Is Borax a good stain remover? 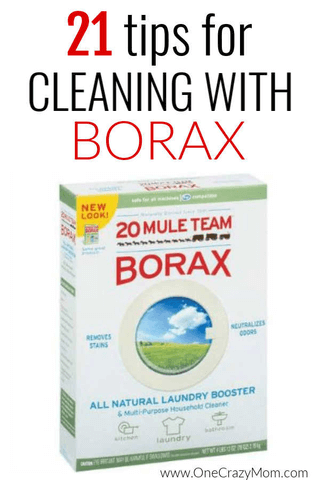 I use Borax in my homemade laundry detergent because it is such a great cleaning agent. 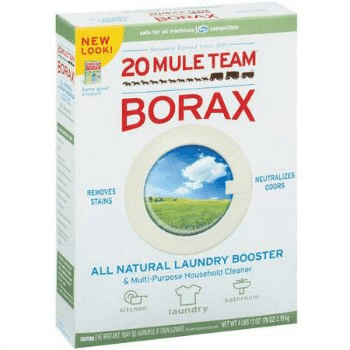 I know my grandmother used to throw a bit in the washer for really tough loads, but I had no clue until recently what a great all-purpose cleaner Borax is. Is Borax good for cleaning? There are tons of uses for borax and cleaning. I am still amazed at how many things one little box can accomplish and for so little! It is a natural laundry booster but it has all sorts of fabulous uses around the house. Can you buy borax at Walmart? Cleaning with Borax is very easy and even better, it is very frugal. A box of Borax will set you back about only $5, but a little goes a long way. A $5 box will last quite a while. You can buy it almost anywhere like Walmart or including HERE on Amazon. Grab a box of borax cleaner walmart or even your local dollar store sells smaller boxes. 1. Weed killer – Sprinkle Borax around cracks in your sidewalk or driveway to kill weeds. Be careful, this will kill all other vegetation too so don’t use near your grass or garden. We also have a homemade weed killer here too. 2. Mold cleaner – Make a thick paste with Borax and water and rub over mold prone areas. Let the paste dry (give it about 24 hours). Brush the dried paste away and rinse clean. 3. Pest control – Sprinkle Borax around the perimeter of your home to keep critters out. 4. Outdoor furniture upkeep – Mix together about 1 tablespoon of Borax, 1 tablespoon of dish detergent and a gallon of hot water. Use a sponge or wet rag to wipe down outdoor furniture with your solution. 5. Clean brushes and combs. Fill your bathroom sink with hot water then add about 1/4 cup Borax and several drops of dish washing detergent. Run combs and brushes through the water several times. Rinse with hot water and let air dry. 6. Deodorize a trash can. Fill the bottom of your trash can with hot water and a few tablespoons of Borax. Let it sit for at least 15 minutes, then rinse. Dry the trash can with a paper towel. When the trash can is completely dry, sprinkle about 1 tablespoon of Borax in the bottom of the can – this will help keep it fresh and keep creepy crawlies away. 7. Get rid of that urine smell. I use vinegar to clean pee stains, but I recently read that you can use Borax to do the same thing. Sprinkle Borax on the mattress and rub in with a wet cloth. Let it sit for about 30 minutes and then vacuum up. 8. Clear drain. If you have a clogged or gunky drain, pour about 1/2 cup Borax in the drain and then pour a few cups of very hot water after. Let it sit about about 10-15 minutes and then flush with water until the drain is clear. 9. Kill ants. Sprinkle one part Borax to one part sugar around ant colonies. The ants will eat the mixture, carry it back to the colony and die. 10. No more mildew smell. Fill the washer with water (set to small load). Add in a cup or two of Borax and your mildew smelling towels. Let this sit about about 30 minutes and then wash as usual. 11. Freshen the garbage disposal. Pour 2-3 tablespoons of Borax in the disposal and let sit for about 15 minutes. Run warm water and disposal for about a minute. 12. Fresh fridge. Mix together 2 cups of warm water with 1 tablespoon Borax in a spray bottle. Spray and wipe down the inside of your fridge for a fresh, clean smell. 13. Deodorize the litter box. Spread no more then 1/4 cup Borax in the bottom of an empty litter box and cover with your normal litter. The Borax will help reduce those not so nice smells. Be careful not to use too much. As long as your kitty doesn’t ingest the Borax he will be safe. 14. Carpet cleaner. Mix equal parts Borax and baking soda. Spread over carpet and let sit for 15-30 minutes. Vacuum up and you’ll have nice fresh carpet. – This is one of my favorite uses! 15. Clothing stain remover. Mix together 1 tablespoon Borax and a couple of tablespoons of warm water. Use this to rub on clothing stains. Let sit for a few minutes and then wash like normal. Now that you know how to use borax in laundry, your clothes will sparkle. 16. Carpet stain remover. This is similar to the laundry stain remover, but mix in another couple tablespoons of water. Use a clean rag to blot at any carpet stains. Let sit for a few minutes, pat dry and vacuum up. Try my other homemade carpet cleaner here too. 17. Goo be gone. Make a mixture of 1/4 cup Borax and 1/2 cup warm water. Use a clean rag to rub the mixture on any sticky surfaces to remove the residue. 18. Get rid of water spots. If you notice unsightly water spots on your dishes, try adding 1 tablespoon of Borax to the dishwasher before you run it next time. 19. Clean the humidifier. This is something that needs to be done regularly, but honestly who does it? Simply dissolve 1 tablespoon of Borax in a gallon of water and run it through the humidifier. Rinse out the tank and run another clear gallon of water through the humidifier. There you have it – nice and clean. 20. Gentle dish cleanser. Borax is non-abrasive so it works great at cleaning fine china and stainless steel pots and pans. Just sprinkle a little in/on your dishes and clean with a soft, damp cloth. Rinse well after using this borax cleaning solution recipe. 21. Mop the floor. Add 1/2 cup vinegar and 1/4 cup Borax to a sink full of hot water. Add in 1 squirt of dish detergent and mix well. Use this solution to mop the floor. Rinsing isn’t required when cleaning with borax and vinegar. 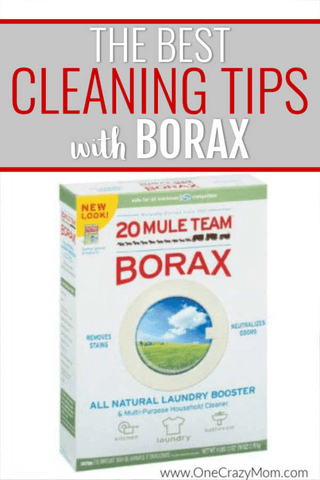 Those are my 21 favorite and frugal tips for cleaning with borax! Borax is just so versatile. From borax bathroom cleaner to borax stain remover, it does it all! There are even borax uses for skin and other uses. Plus, borax to clean toilet! One ingredient does so much and for such a small price tag! 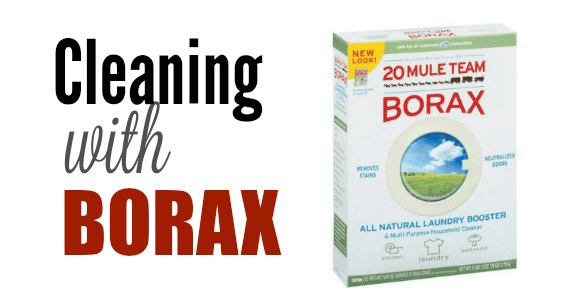 Do you clean with Borax? Learn how to get pee out of mattress. The solution is simple and you probably already have everything you need at home. Get your kitchen in order with these creative and budget friendly dollar store kitchen organization ideas. Learn what to put in a storm shelter so that you and your family will be prepared. Find out the best stain remover for clothes. We have the best stain remover and it is so frugal and works great. Borax also works in cleaning hard water deposits, lime build-up. Such good information, some I knew but a lot I didn’t, thank you. Where can we buy borax? I clean my porch brick with borax! Where to buy Borax? Walmart. Our store has it on the bottom of the shelf in the laundry detergent area. I’ve been using Borax to wash clothes for yrs. I use it to clean the toilet. Sprinkle in, let it sit for a while, then scrub.